Imagine strolling in your local shopping center or mall. Your stomach growls, and try as you might to suppress the hunger pangs, your stomach chides you for not feeding it and satiating its need for food. 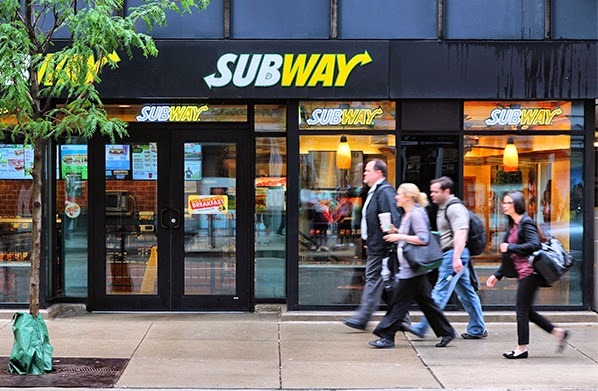 Without further ado, you stroll into the nearest Subway, eager to purchase a five-dollar footlong. As you stand waiting, you watch a young lady prepare your lightly toasted sandwich. She is about high school age, and you think, She really should be taking a break or studying right now. The young lady hands you the sandwich and you order an extra bowl of steaming minestrone. Heading towards the cashier, this time a middle-aged man, adds up the cost and says “$7.50 please.” You hand him your credit card to swipe, and he hands you the receipt, places your food in the bag, adds a few extra napkins, a fork and a spoon, and off you go, ready to enjoy a fresh, hot meal. Why is his line of reasoning wrong? Because creating a price floor above the equilibrium wage actually “create a surplus of labor,” which in turn leads to unemployment. This will in turn, “reduce aggregate production.” Later on, it will cost more to produce. This is not even efficient production! It is a slippery slope that will soon get an economy into trouble. Then Prasch argues that higher wage rates will “contribute to overall economic growth” through “the elimination of marginal, low-productivity firms, and the enhanced productivity of surviving firms.” He believes the higher wages will push the surviving firms to be more innovative in developing new technology that will help these firms in efficient production. He declares that if wages are pushed above the wage equilibrium, then marginal, low-productivity firms will be eliminated and the surviving firms will thrive. But now notice that since there are fewer firms, the costs of maintaining business and thriving will have to occur at a higher cost of production. No company wants to be more efficient in production just to find that their costs of maintaining business are sky-high. Again, his reasoning doesn’t make sense. Technological advancement can only benefit businesses if the new technology efficiently increases production at a lower cost than before when the technology wasn’t there. What Prasch is really saying is that he prefers fixed working hours. Having higher fixed working hours will actually dissuade workers to work longer hours. Also, since Prasch states that “all parties have their needs met,” he seems to imply that only when both employee and employer have all their needs met can contracts proceed. Such an assertion is actually limiting and unreasonable, contrary to what Prasch believes. In the end, no free trade will result because of this restriction. Economically speaking, someone’s needs must be met through trade and exchange. Nobody’s needs can all be met all at once. Prasch’s ideas to “help” society are certainly not backed by economic principles. Now should his intentions actually be good-natured, he should instead consider petition to end the minimum wage. He should instead advocate for allowing workers to negotiate their own terms with their employers. Currently, the minimum wage actually slows society from efficient production. An aftermath of the recession is that we are seeing an increase of older workers in jobs that traditionally were serviced by younger unskilled workers. This is most obvious in the fast food industry where older workers with rich real world experience have displaced unseasoned high school graduates or part time college students in relatively low-skill jobs. The older workers may very well have tried harder to find jobs more equally matched to their skill sets and would not have settled for the fast food jobs had it not been for the artificial wage floor of the minimum wage requirement. They could be contributing more productivity to the economy. The impact to the displaced unemployed young workers is that they have no jobs and have also lost the opportunities to acquire the customer service skills that this entry level job would have provided—real world training in dealing with customers and managing money and time that over the years would make them more employable. As you walk out of Subway into the main part of the mall, you hear the young lady say, “Dad, why don’t you go home? After all, you could be programming or fixing computers now. Why not go home, take a break, and fix our family computer, which froze three times today? Mom also left me a message stating the local Office Max has a problem with its computers and it would like to know if you could be available.” He agrees and sighs. “Yes, I should go. If my pay were any lower, I wouldn’t even be here.” She gives him a quick hug and goes back to her work—crafting sandwiches for her eager customers. Loren is a junior who has a passion for biology and music. This is her fourth year as a first violinist for the San Francisco Symphony Youth Orchestra. In her spare time, she enjoys biking with her Australian Shepherd Wish, hiking, running, dogsledding, and traveling. When she grows up she would like to become a medical physician. This is an interesting article. There's one key thing to bear in mind when considering labour markets, however, which many people forget. In your fifth paragraph, you state that "creating a price floor above the equilibrium wage actually “create a surplus of labor,” which in turn leads to unemployment". This is ONLY true in competitive labour markets, where the initial wage is determined by the intersection of the 'supply of labour' curve and 'demand for labour' curve. The extent to which competitive labour markets exist is very dubious. A perfectly competitive labour market would have workers with identical traits, availability and skills, would have no geographical inflexibility, would have many firms demanding labour, would have no barriers to entry/exit and high-quality information would be available to all. The smaller the extent to which these factors are present in a market, the less competitive that market is. If a labour market is NOT competitive, those who demand labour - firms - will possess a degree of market power. For each firm, we may assume that their workers' wages will be set where the MRP (Marginal Revenue Product) curve, which can be simplistically treated as the market's 'demand for labour' curve, meets the firm's 'marginal cost of labour' curve, which cannot be treated as the market's 'supply of labour' curve. This creates a scenario where wages are LESS than the "market-clearing equilibrium" level. If a minimum wage is imposed in this market, it's entirely possible that wages will increase AND unemployment will DECREASE (provided the minimum wage-rate is set below the market's "market-clearing equilibrium"). Remember to always challenge assumptions that markets, prices and wages perfectly adjust to changes in demand or supply. Remember to always challenge assumptions that markets are competitive, and that price is set where demand equals supply. This is not always the case.